Speaking of Women's Rights: With Liberty and Justice for . . . Who, Exactly? With Liberty and Justice for . . . Who, Exactly? His name was Jimmy. He lived a few doors down from me, and we were in the same class. His parents were immigrants to the U.S., and English was his second language. Though I don’t know where he is or what happened to him, he came to mind when I saw the recent flap about Seattle Schools requiring every class to recite the Pledge of Allegiance every day. Every year, on the first day of school, Jimmy had to go to the teacher and explain that he would not be participating in the Pledge of Allegiance. Perhaps his parents did it for him in the very early years, but by 4th grade, Jimmy was on his own. 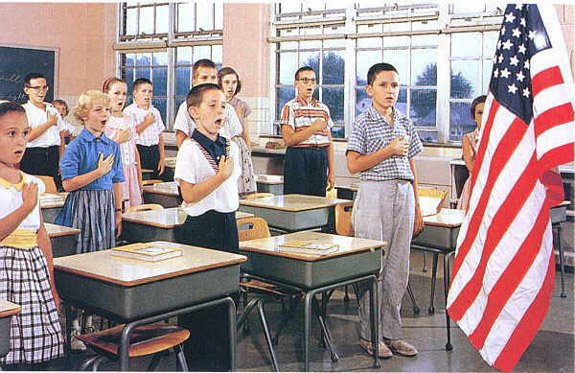 His religion forbade him from saluting the flag or saying the Pledge, on the basis that it is blasphemous to worship, serve, or pledge allegiance to any secular image, because such idolatry interferes with undivided loyalty to God. As for me, though I always recited the Pledge at assemblies and other events, I also always omitted those two words. Not because of any anti-religious motivation, but because I viewed them as imposing one view of religion – Judeo-Christian – on those of other beliefs and those who do not believe in God or a god. It made me uncomfortable for the state, the school, the mass of people, to require people of different faiths to use the words of the majority. Or maybe I was just thinking of Jimmy. But at bottom, the inclusion of those two words, or even the stern admonition to recite the pledge, is not the most troubling feature of this controversy. Rather, it’s that we ask all children to say we are one nation, and that we are indivisible, and most important, that we believe in liberty and justice for all, yet we do not ask ourselves to live that way. We are not indivisible, and we certainly don’t ensure liberty OR justice for all. As a nation, we continue to discriminate against women, we refuse to treat LGBTQ persons equally, we deprive immigrants of many of the blessings of liberty. In fact, we are horribly divided, and schoolchildren with their hands on their hearts won’t change that. Only we adults can make that true. And we don’t seem to be trying very hard.